Blind Man's Buff is a dramatic and intensely bizarre-looking sculpture that explores sensual and textural opposites. Looking like a biological homunculus of sexual form it is one of the most successfully resolved of a number of sculptures that Bourgeois made in the late 1970s and early '80s that incorporate a landscape of 'udders' into themselves. Carved out of marble, the essential element of Blind Man's Buff is what Bouregois has termed "polarisation". 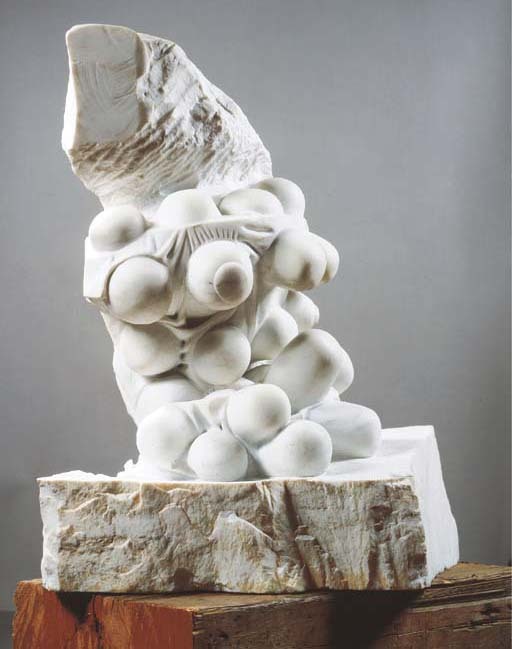 By this she means the deliberate setting up of an emotional tension between clear formal opposites: between the soft rounded forms of the udder landscape and the cold hard nature of the marble from which they have been chiselled, as well as between the implied softness of these mammary-like forms and the rigidity and stiffness of the sculpture's construction and its clearly phallic form.